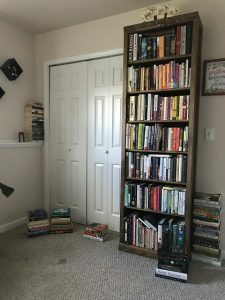 One of my favorite book blogs is 746 Books, where Cathy Brown chronicles her efforts to read all 746 unread books she has accumulated in her home. She inspires me to focus on reading all the amazing books I’ve acquired over the years, as opposed to constantly seeking out new reading material. I’m not great at it, but I’m working on it. For the fourth year in a row, Cathy is hosting a 20 Books of Summer reading challenge. Participants aspire to read 20 books between June 1st and September 5th, with most readers appearing to choose their books ahead of time. I’ve decided to participate in this year’s challenge even though I am skeptical of my ability to complete it. 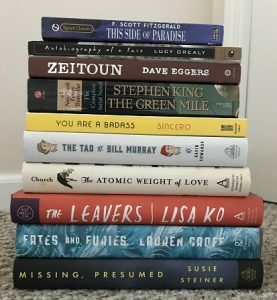 As of today, I have read 57 books this year. That puts me at 11.4 books per month, which obviously is more than enough to complete 20 more books in the 95 days of the challenge. Where I’m challenging myself is by selecting the 20 books ahead of time. Just the thought of it makes me nervous! Typically I have a few books lined up in the pipeline, with an idea of what I want to read next but I don’t always go in order. I’m often distracted by new releases in my library’s “Most Wanted” section (which means no holds, no renewals, and a 14 day lending period,) or a sweet find at a thrift store. I painstakingly sorted through my shelves today and made a stack of 20 for the challenge. Since I’m big on quitting a book I don’t like, I’ve selected 5 alternates. It’s a pretty eclectic mix, I’m proud of the wide range my collection covers. Some of these books I’ve owned for years, others are recent acquisitions, but they’re all ones I’ve been meaning to get to! 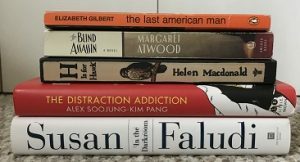 So while I am pursuing the goal of reading 20 books in the next three months, my main goal this summer is to get through 25 of my own books. After reading a book, I’ll choose to give it away or keep it in my collection, but either way that’s a huge stack I’ll have sorted! What do you think of the 20 Books of Summer Challenge? 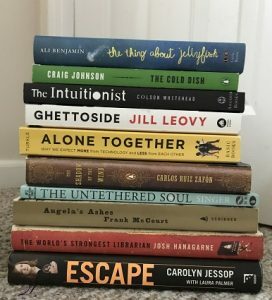 If that feels like too many, there are options for a 15 or 10 book challenge as well! 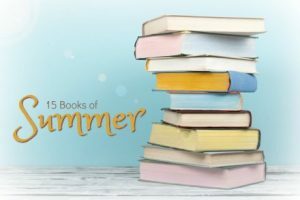 Whether you’re a blogger or not, I invite you to join me on my bookish summer adventure! Some good ones in there!! I love Angela’s Ashes and Shadow of the Wind is great!! I’m like you although even less of a planner, I’m sure I will read 20 books but putting them aside prior to is daunting. Maybe I will pull a stack tonight! Thanks so much for your kind words and for taking part in the challenge! 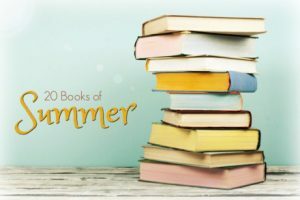 I love your list – Zeitoun is a great book. Happy reading! Thanks for visiting my site! I love yours and am excited about the challenge! I finished Zeitoun yesterday. I can’t believe I waited so long to read it, what a powerful book and incredible story.